Imagine a peaceful sanctuary where you leave the stress of the day behind, connect with nature, revitalize your soul, and enjoy what truly matters. 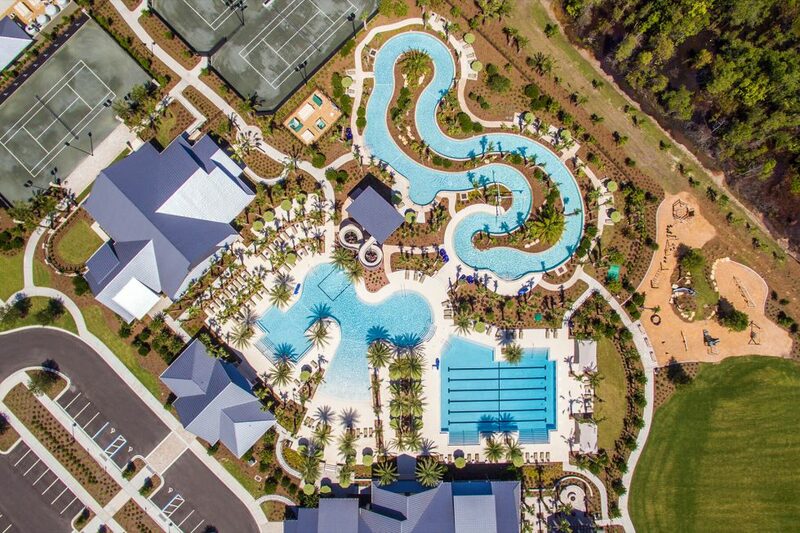 Shearwater, a unique community in St. Johns County, Florida, offers a remarkable array of amenities which you’ll be delighted to come home to. Residents enjoy a full calendar of community events and holiday festivities. Imagine camping out under the stars with neighbors and friends telling stories around the fire at Shearwater’s S’mores and More event. Discover the multitude of social and recreational activities at Shearwater. Whether you’re looking for a spot to relax or splash around, Shearwater has you covered. Soak up the sun and stay cool in the resort-style lagoon pool, or switch up your workout routine and swim some laps in the multi-lane lap pool. Thrill seekers will appreciate adrenaline-pumping spins on the three-story waterslide tower, called ‘The Perch’. Round out the day with a peaceful, meandering float along the Lazy Bird River – the longest lazy river in Northeast Florida. Imagine all of these activities and more are practically in your backyard! Spend time with good company in a space you love. The Kayak Club is the heart of Shearwater, providing residents with a central hub for recreation and relaxation. The Kayak Club has plenty of gathering spaces both indoor and outdoor, so whether it’s rain or shine there’s always a perfect spot. Plenty of comfortable seating and large televisions make it perfect for watching the big game. Raise the bar on your affinity for healthy living and exercise with plenty of outdoor fitness opportunities. Perfect your poses on the Yoga Lawn, or enjoy exhilarating games of tennis on the four Har-Tru® tennis courts. Even the youngest Shearwater residents can enjoy fresh air and fun with their own Free-Range playground featuring Kompan® play equipment. Within walking distance from anywhere in the community, the oversized Fitness Lodge makes getting a great workout easy. Complete with state-of-the-art cardio and weight-training equipment, you’ll have everything you need to make your workout count. Wellbeats® virtual fitness classes are available on demand, providing hundreds of classes and making it easy to try something new. If you prefer personalized attention, consult with one of the on-site personal trainers to create a routine that is tailored to you and your needs. With over 13 miles of trails there will always be a new adventure waiting! Whether it’s a family bike ride, leisurely stroll or your morning jog, the views of nature and wildlife will never be quite the same. Trails run through the entire community, connecting residents not just to nature but to each other, making it easy to visit nearby friends. In just a few minutes, you can walk from your home to the Kayak Club, visit Trout Creek or walk your kids to school! Interested in learning more about Shearwater? Join our Founders Club to receive updates and news about the community.